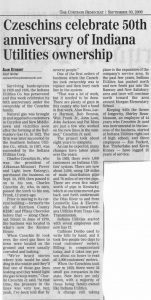 Indiana Utilities Corporation has had a long-standing presence in Harrison County Indiana with its beginning dating all the way back to 1822 when Corydon and New Middletown were served by the Railroaders Gas Company and was later succeeded by Southern Indiana Utilities Co. Back in those days, the number of customers was in the hundreds and bills were hand written. The office, as you can see in one of the scrolling photos above, was once in what is now the Kintner House Inn and the 1940 Chevrolet was a beauty. Now the service area reaches nearly the entire length of the county south to north serving Elizabeth, New Middletown, Corydon, New Salisbury, Ramsey, and Palmyra and hand writing the bills might be a challenge with a customer number that is over 3,000. In 1959 Charles Czeschin Jr. purchased the company and worked to repair, upgrade, and grow the company now his son Frank is the company’s president. In as many years’ things have changed for servicemen walking and hand writing meter readings in meter books to readings be gathered electronically by ERTs and sent to a computer in a service truck as it passes by. As well as steel lines, have become polyethylene pipe. One thing has not changed and that is Indiana Utilities commitment to the safety of its customers and to deliver the best quality natural gas at the best possible price.